NOTE: This is the third commentary in our series Electrification 101 – a discussion aimed at informing transportation professionals, decisionmakers, and the public at large of the value and advantages of electrifying transportation operations, and the electrification of public transport systems in particular. The following essay is a slightly edited version of a summary position paper disseminated by the author at a recent Peak Oil conference in Washington, DC. This article is a moderately revised update of the one originally published in May 2006. Alan S. Drake, a former accountant, is an engineer, and professional researcher based in New Orleans. Electrifying railroads and transferring half of the ton-miles of trucks to rail should save 6.3% of US oil consumption. Japanese and most European railroads are already electrified. The Russians finished electrifying the Trans-Siberian Railroad, from Moscow to the Pacific, in 2002 and electrified to the Arctic Ocean at Murmansk in 2005. So there are no technical limitations. Electric railroads are cheaper to operate and can carry more freight because they accelerate and brake faster (and can generate electricity while braking, saving energy), and have no delays for refueling. Railroads are 8 times more energy-efficient than heavy trucks. The US used 19.8 million barrels/day in 2002 with two-thirds for transportation. (Today, roughly 20.7 million barrels/day.) Railroads carried 27.8% of the ton-miles with 220,000 b/day whilst trucks carried 32.1% of the ton-miles with 2,070,000 b/day (2002 data). In the era of cheap oil and toll-free interstate highways, US railroads cut back capacity (often tearing up one of two tracks) and ceded much cargo to trucking. Today, intermodal shipments (local trucking, long distance by rail via containers or roll-on/roll-off) are growing rapidly – but this trend must be accelerated! 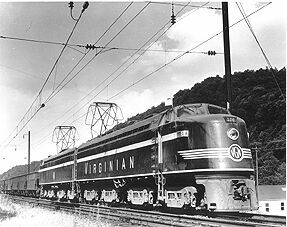 The Virginian Railway was one of a number of US railroads that electrified their mainline operations – both freight and passenger – beginning in the early 20th century. 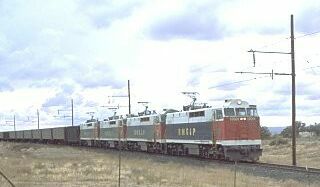 Cheap and seemingly abundant oil was a major factor persuading railroads to de-electrify in favor of diesel propulsion. US railroads have pointed to property taxes as the reason that they did not electrify (no taxes on their diesel, property taxes on electrification infrastructure). Simply exempting any rail line that electrifies from property taxes under the interstate Commerce clause would undoubtedly promote the rapid electrification of many rail lines. Expanding capacity (adding tracks, better controls, grade separation, etc.) and adding intermodal transfer points will be more economically attractive without the burden of property taxes. Removing property taxes on railroads would take "the thumb off the scale" in the economic competition between rail and trucks. Trucks pay no property taxes, directly or indirectly, on the value of their right-of-way. Trains do. Local jurisdictions that lost more than a certain percentage of tax revenue could have the excess compensated by the Federal Government. 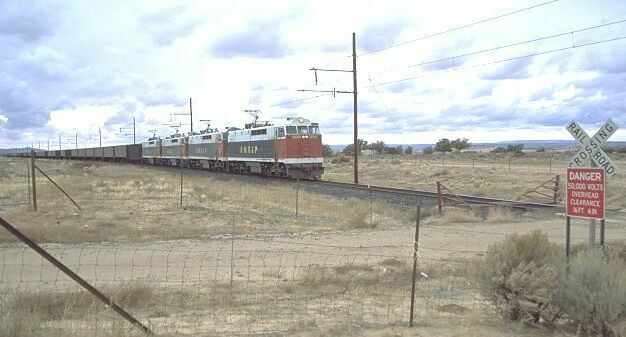 Electric freight railroading in the USA: Four powerful modern electric locomotives haul a coal train on Arizona's 78-mile Black Mesa & Lake Powell Railroad, which links a coal mining operation with a major regional power generating facility. Building the gas-saving equivalent of twelve DC Metros would save 4% of US oil use (6% of transportation oil use). New electric mass transit will benefit the US much more than new highways. In 1970, 4% of DC commuters used city buses to get to work. Today over 40% use public transit. The difference is the 106 miles of Washington Metro that has been installed in the interim. Washington Metro saves between a half billion to a billion gallons of gasoline per year directly and from changes in urban and suburban development patterns. These savings will only increase in coming years. 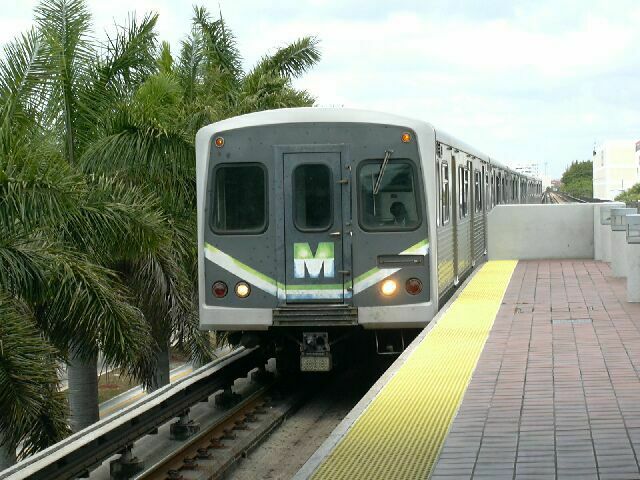 Miami MetroRail train races into elevated Coconut Grove station in June 2004. It will take 25 years to build a system that will transform Miami as Washington and San Francisco have been transformed, saving billions of gallons of gasoline. But why so long? Because FTA funding has declined from 80% for "New Starts" rail projects to 50%. The DC Metro extension to Tyson's Corner and then Dulles Airport is being held up due to lack of FTA funding. Increasing FTA funding to 90% (the same percentage that built the interstate Highway system) will dramatically speed existing plans in Miami, Denver, Dallas, St. Louis, Salt Lake City, San Francisco-Bay Area of California, Washington, DC, Portland, New Orleans, New York City, Los Angeles, Charlotte, Sacramento, Houston, Phoenix, San Diego, Atlanta, and many other metropolitan areas. Better federal funding will undoubtedly result in an explosion in urban rail, from streetcars in small cities to larger light rail in larger cities and rapid rail in the largest cities, and with widespread commuter rail. Budget space could come from reductions in federal highway funding or as a supplement for the Strategic Petroleum Reserve (SPR). As noted above, the interstate Highway system was built with 90% federal funding; yet the current administration has cut federal funding for new urban rail from 80% to 50%. The United States once built 500 electric streetcar systems in less than 20 years. Most cities and towns of 25,000 or more got a non-oil electrical transportation system. The US did this with a population of less than one-third of today's, approximately 3% of today's GNP, and relatively primitive technology. Electric trolley buses are cheaper and lighter, they last much longer, they are pollution-free, and are quiet, smooth (much less jerky) and more attractive to passengers than fossil-fuel buses. They obviously require overhead wires and electrical infrastructure. Four US cities currently operate electric trolley buses and a fifth will soon. Hybrid buses, with minor engineering changes, can operate part-time as electric trolley buses and off-wire for part of their routes. This mixed use would significantly reduce their diesel fuel consumption. The FTA currently funds 80% of bus replacement costs on a twelve-year cycle. Many experts feel that 15 years would be more appropriate. Perhaps FTA could fund fossil fuel replacement buses on a 13.5-year cycle at 75% and trolley buses (with their electrical infrastructure) at 92%. 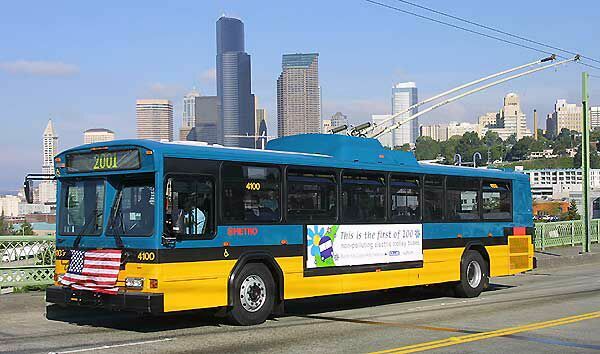 Seattle is one of a number of North American cities operating electric trolley buses. Regularly accommodating bicycles on urban streets and converting excess motor vehicle capacity to bike lanes can help to encourage bicycling as a more significant form of urban transportation. Simple steps, such as more bike racks in city downtowns, would make bicycle commuting more convenient. This would be a city-by-city effort providing the opportunity for unique approaches in every locale. So a national program is less effective, other than making it patriotic to bicycle to work, school, and shopping and promoting bike racks at urban rail stops or allowing bicycles to be carried on transit vehicles. Suppose, as one of several possible future-risk scenarios, that an islamic Republic of Arabia replaces Saudi Arabia and the new islamic Republic exports only enough oil (at elevated prices) to buy food and other essentials (no longer having to support 6,000 princes in luxury). The United States would face a severe and prolonged oil supply interruption. It is likely that the US government would immediately institute a variety of oil conservation measures; these could include: a 50-mph speed limit; a 4-day work week; limits on sports events; restrictions air travel; etc. The nation would also immediately start draining the SPR. Demand for electrified urban rail would swamp the capacity of every system in the country. Freight railroads and Amtrak would also likely be overwhelmed. Once the SPR is half-drained, perhaps in three or four months, even more severe oil demand restrictions would be required, such as rationing. Every urban rail system, and almost every line, could handle more passengers if they had more rolling stock. Their capacity is limited in other ways as well (platform length, park & ride lots, bicycle racks, etc. ), but rolling stock is almost always the first limiting factor. Likewise, certain types of rail cars would be the first limiting factor on our freight railroads. So a Strategic Railcar Reserve (SRR) would allow existing urban rail lines to carry more passengers, and more railcars would allow more freight to be shifted from trucks, thus reducing US oil demand in another dimension and allowing the SPR to last a few days longer. Once the SPR is exhausted, the SRR (and all the steps above) would still be benefiting the nation. Buying more railcars would be cheaper and better than buying more oil for the SPR. Rail cars are made in the USA, their benefit will last much longer than extra barrels of oil, they can be used and not disappear in even minor oil supply interruptions, and they are cheaper, per barrel saved, than $75 oil in a prolonged emergency. Every US urban rail system should estimate its likely demand in the case of an oil supply interruption and what would be required to handle this demand with heavy loads. in some cases, soon-to-be-retired cars could be mothballed, but new cars would be required for the SRR in most cases. Twenty BTUs of diesel fuel for one BTU of electricity is the energy trade by shifting from heavy trucks to electrified railroads. Replacing 2 million barrels/day of heavy truck diesel fuel will take just 1.4% of US electricity. Transportation use of electricity (all subways, light rail, Amtrak's NEC) in 2004 was 0.19% of all US electrical demand. The gasoline-saving equivalent of a dozen new DC Metros will likely double that 0.19% figure. Ten years is more than enough time to conserve or build the modest additional capacity. These proposals and overlooked steps will complement the more widely discussed steps of more fuel-efficient cars, ethanol substitution, and other measures. They are complementary and not mutually exclusive. And the steps outlined above can be started immediately; they require no new technology, and will have a significant impact in the medium term. Taking these steps will positively affect US oil supplies faster than drilling in the Alaskan National Wildlife Refuge (ANWR), produce at least twice as much oil savings as ANWR will produce at its peak, and never deplete (Prudhoe Bay, Alaska is producing at approximately 20% of its peak, Washington Metro hits a new peak in oil saved every year). So, if one supports drilling in ANWR, these steps are even better. it is simply not logical to support drilling and not support these steps. And if one opposes drilling in ANWR, then these steps are a larger, faster, longer-lasting, and environmentally positive substitute. Sometimes good public policy is good politics. Reducing US oil consumption, reducing greenhouse gases, improving the US economy, reducing congestion, providing transportation alternatives, and reducing the number of 18-wheel trucks on the highways should be both good public policy and good politics! 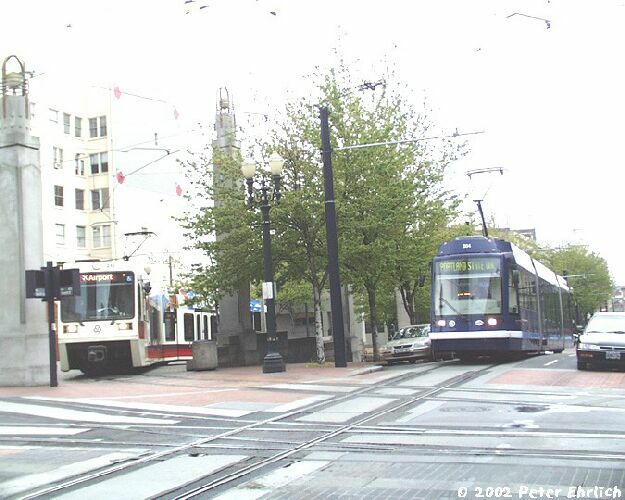 Portland, Oregon: Streetcar (right) passes MAX interurban-type LRT train (left) at one of the points where both systems intersect. It is worth noting that four American cities – Washington DC, New Orleans, Oakland, and East St. Louis – could benefit from more urban rail, mainly streetcars and larger light rail, but cannot afford even 10% matching funds. Two of these cities, Washington DC and New Orleans, are of particularly prominent national significance and international stature. Washington, DC's Department of Transportation (DC DOT) has a plan for 40 miles of streetcars in the District, and the author helped develop a 35-mile plan for streetcars in New Orleans. It would benefit the nation as a whole (in reduced gasoline use and international exposure, and as a learning tool for other cities) to fully fund streetcar systems in these cities. One goal of such a program should be reducing the cost of building streetcar lines.